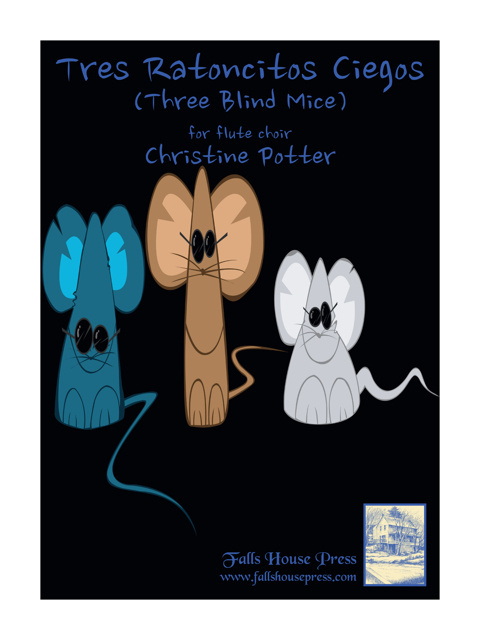 Tres Ratoncitos Ciegos (Three Blind Mice) was commissioned by the Flutissimo Flute Choir in Texas for their children’s concerts. It is scored for 2 piccolos, 4 c flutes, alto, bass and optional slapstick. In addition to the well-known melody, it includes a hint of Mozart, a tango, two Mexican Hat Dances and a dash of Rossini. It requires the performers to flutter tongue, clap their hands, speak, and create an airy sound to mimic mice dashing across the floor. It is level 3 in difficulty and three minutes long. Keys covered include G Major, A flat Major, and C Major. The piece would be especially suitable for a lighter moment in a performance, for a children’s concert or a senior center program!